URBANA, Ill. – Trailer parks offer an affordable place to live for 12 million people in rural America. Despite crude jokes, slurs, and the “trailer trash” stereotype that trailer park residents sometimes must endure, they are often families raising their children, hoping to grab hold of the American dream of home ownership. 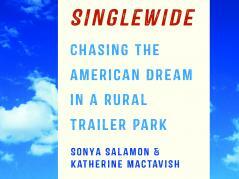 In her new book, Singlewide: Chasing the American Dream in a Rural Trailer Park, anthropologist and ethnographer Sonya Salamon and co-author Katherine MacTavish discuss how the American housing dream in rural trailer parks is often just that—a dream— that is rarely realized by those working poor families who call these parks home. Salamon, a professor emerita in the Department of Human Development and Family Studies at the University of Illinois, along with MacTavish, an associate professor in Human Development and Family Science at Oregon State University, followed 39 families raising their school-aged children in three rural trailer park sites in the United States, each for one year. They examined the social and financial implications for families living in a trailer park. Throughout the year, the researchers immersed themselves in daily life in the parks, exploring the sense of community at each site and how the children in these parks were developing. The parks in their study included a predominantly white park in downstate Illinois, a predominantly Hispanic park in New Mexico, and a predominantly black park in North Carolina. Only families who owned their trailer homes, and lived in a land-lease trailer park were included in the study. In Singlewide, they present the stories of these families, including a few who moved up and out of the trailer park, but most who did not. The residents in the parks, Salamon explains, were poor or of modest income, but they were not the poorest residents of rural trailer parks in America because they lived in land-lease parks where they owned their homes. People who rent their homes in rental trailer parks tend to be poorer. But most of the families found themselves financially “trapped” in the trailer park. To improve their housing situation, some families opt to “trade up,” buying a new trailer with the same kind of loan in the same park from, at times, vertically integrated companies that not only own the parks, but also produce and sell the trailers, and provide the financing. Hoping to break through some of the stereotypes, the authors asked residents if they felt discriminated against because of where they lived, or had heard the slur “trailer trash” used. The answers varied by site and ethnic group. One takeaway from the book is that the only people reporting that they consistently felt the “trailer trash” stigma were whites in the Illinois trailer park, and whites in the other sites. “We came to understand that the ‘trailer trash’ slur signified a middle-class put down, but it was also a variant of being called ‘white trash,’” Salamon says. Interestingly, the white residents in the Illinois park also felt the least sense of community. But for the white families in Illinois, their trailer park was not incorporated into the nearby larger town, which Salamon says may have led to a greater sense of segregation and discrimination for the residents there. White youth living in Illinois seemed to find a sense of community with the other children who lived in the park, while at the other sites, it was in the wider community and within family for Hispanics, and among church and extended family members for blacks. Some youth found opportunities to move out of the park. “If a youth found some sort of middle class mentor, whether in a church or school, that was a major factor,” Salamon explains. “The park youth all thought they wanted to go to college but most didn’t have a clue about what it took – that was where a mentor made a difference. By the conclusion of the book, Salamon, an expert on land-use and small towns in rural America, and MacTavish emphasize that trailer park families see themselves as “doing the best for their families,” despite the financial and social pitfalls they may face. Singlewide is now available in paperback and can be purchased from Cornell Press, or wherever books are sold. For more information, visit sonyasalamon.com.